어린 막내딸을 먼 길 마다치 않고 걸어서 평양의 목사님 댁에 맡기신 어머니의 신실한 믿음과 신학문에 대한 열정이 이효덕을 민족을 깨우친 사회운동가의 초석이 되게하였다. 이효덕은 1895년 평안남도 삼화에서 아버지 이인수, 어머니 박상일 사이에 6남매 중 막내로 태어났다. 고향에서 가장 먼저 예수를 영접한 부모님과 삼화읍 감리교회에 출석한 즐거운 추억은 평생 그녀의 삶을 지탱하는 버팀목이 되었다. 주변에 소학교도 서당도 없던 시절, 그녀의 어머니는 어린 딸을 목사님 댁에 맡겨 한글을 깨우치게 하였다. 교육에 대한 남다른 열정을 가진 어머니의 영향으로 그녀는 신앙 안에서 신학문을 받아들이게 된다. 사경회를 마친 후에는 광혜여원 전도부인 홍유례의 집에 맡겨 소학교에 입학시켰다. 후일 농촌운동과 여성운동에 큰 발자취를 남긴 황애덕, 황신덕은 홍유례의 딸들이다. 그녀들과 함께 평양의 정진 소학교에 입학하게 되는데 이때 어린 효덕은 “ 나는 시집 안 가고 전도부인한다” 고 결심을 하게 된다. 소학교 졸업 이후에는 어머니의 열정에 힘입어 숭의여자중학교에 진학하였는데 그녀의 셋째 오빠가 독립운동과 관련하여 만주로 망명하면서 집안 형편이 어려워져 수예와 바느질을 하며 공부하여 1911년 졸업을 할 수 있었다. 졸업 이후 고향 삼화읍 교회에서 교사와 전도부인으로 활동하다가 이듬해 1912년 모교인 숭의여자중학교 교사로 부임하여 학생들을 가르쳤다. 이효덕은 학생들에게 지식뿐만 아니라 민족의식을 불어넣는데도 열심이었다. 삼천리 강산의 지도를 보여주며 우리나라의 역사를 가르쳤다. 뿐만 아니라 동료교사들과 상급반 학생들과 비밀결사조직인 송죽회를 결성하여 독립군 자금을 지원하고 망명 독립군 가족을 도왔다. 중화의 양무학교에서 학생들을 가르치던 중 3.1운동이 일어나자 학생들을 이끌고 만세 시위에 참여하였다. 이효덕의 삶에 커다란 전환을 가져오게 된 3.1 운동 참여로 그녀는 1년여의 옥고를 치르고 출옥 후에는 감옥에서 얻은 병으로 그만 병상에 눕게 되었다. “내게 다시 살 기회를 주신다면 10살 때 결심하고 약속한 대로 성경학교에 가서 공부하고 전도부인이 되겠습니다.” 그녀는 간절히 기도했다. 병은 기적처럼 차도를 보였고 이후 그녀는 협성여자신학교에 입학하여 1924년 제1회 졸업생이 되었다. 1929년 조선여자기독교절제회 총무로 취임하는데, 절제회는 식민지 상황 속에서 일본식 타락문화에 대한 저항운동의 성격을 갖고 추진된 모임으로 금주, 금연, 아편 금지와 공창 폐지 등 생활개혁, 정신개혁 운동을 펼쳐온 초교파적인 여성운동 단체이다. 그해 9월부터 50일 열린 전국 박람회에서는 하루도 빠짐없이 매일 저녁 금주와 금연에 대해 강연을 하였다. 박람회가 끝나자 지방에서 그녀에게 강연요청이 들어오기 시작했다. 전국 방방곡곡을 누빈 자신의 순회강연을 이효덕은 ‘순례자의 고행’ 에 비유하였다. 하지만 강연 내용에 삼천리 반도라는 단어가 들어갔다 하여 일제 경찰에 취조를 당한 뒤 몇 주간 강연 금지를 당하기도 하고 정당한 이유도 없이 경찰이 강연을 막기도 하고 심문을 하는 일도 다반사였다. 그런 고초를 겪을수록 그녀는 당대의 남성 기독교계 지도자들 못지않은 설득력으로 순회강연을 이어 나갔다. 그렇게 만주에 이르기까지 약 300여 곳의 절제회 조직을 확대해 나가며 헌신하는 동안 그녀는 일을 할 수 없을 만큼 건강이 악화되며 1936년 절제회 총무직을 사임하였다. 일제 말기 수표교교회 전도사를 거쳐 동대문교회의 전도사로 시무하는 중 해방을 맞았고 한국전쟁을 겪었다. 1956년 여선교회 전국연합회 총무로 피선되었을 때 이효덕은 “월급도 없는 여선교회 형편이지만 하나님의 일이므로 감사히 허락하겠습니다.”라며 총무를 수락하였다. 여선교회 총무시절 그녀는 어려운 여건 속에서도 안식관 운영을 궤도에 올려 놓았고 청소녀회를 조직하고, 윤락 여성을 위한 선교를 시작하였다. 일제 말기 중단 되었던 해외 선교 사업도 재개하였다. 교사로, 절제회 총무로, 전도사로, 여선교회 총무로 50여 년의 세월을 주님의 사업에 헌신하며 쉼 없이 길을 달린 이효덕, 1978년 84세로 세상을 떠나기까지 평생을 독신으로 지내며 오로지 주님과 동행하는 삶으로 일관해온 그녀의 신앙 여정은 오늘날 여선교회의 거룩한 밑바탕이 되어 도도히 흐르고 있다. Lee’s mother never failed to take her, the youngest daughter, to the pastor’s house by walking the long distance. Her sincere faith and passion for knowledge of the Bible became the pillar for the social activist who helped awaken the Korean people. Hyo Duck was born in 1895 as the youngest daughter of 6 siblings to In Soo Lee, her father, and Sang Il Park, her mother. Her parents accepted Jesus very early on. The happy memories at Sam Hwa City Methodist Church became the crucial support to sustain Hyo Duck’s life. Since there were no schools nearby, her mother took Hyo Duck to the pastor’s house. There, she learned to read and write Korean. Her mother’s passion for learning gave a great impact on Hyo Duck’s life. Consequently, she was able to accept new knowledge in faith readily. After graduating from the elementary school, she went to Soong Ui Girl’s Junior Highschool. While she was at Soong Ui, her third older brother got involved in the Independence Movement and sought asylum in Manchuria. As a result, the financial situation of her family became difficult forcing her to help her family by sewing and embroidering. Finally, she was able to graduate Soong Ui Junior High in 1911. After graduation, she worked as a teacher and Bible woman at Sam Hwa City Methodist Church in her home town. In 1912, she became a teacher at her alma mater, Soong Ui. She not only taught students general knowledge but was very passionate about instilling national consciousness in them. Showing the map of Korean peninsula to students, she taught Korean history. She also organized the Song Jook Society and raised fund to help families of the Independence Movement workers who sought asylum abroad. While she was teaching at Yang Moo School of Joong Hwa, the March 1st Independence Movement started. She led her students to the march. She was arrested during the march and spent a year in a jail. After released from the prison, she became ill and bedridden due to hardships she endured during imprisonment. She prayed hard, “Lord, if you give me a chance to live for 10 more years, I would study hard and become a Bible woman.” Miraculously she recovered from her illness. 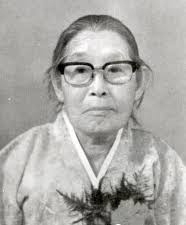 She enrolled at Hyupsung Seminary in 1924 and was in one of the first graduating classes. In 1929, she was appointed as the executive director of Chosun Women’s Christian Temperance Society. This society was an ecumenical Christian women’s organization that advocated change of life style and spiritual renewal. It condemned corrupt Japanese culture, drinking, opium, and prostitution. She lectured continuously for 50 days on abstinence and the vices of smoking at the National Exposition. After the National Exposition, she got many offers for lecture. She compared her lecturing itinerary to a ‘Pilgrim’s Progress.’ She was investigated by Japanese police because her lecture contained contents about the Korean peninsula. Without apparent reason, the Japanese police ordered her to stop lecturing for weeks. She was harassed by police on many occasions. The more she was harassed, the more persistently she continued her lecturing tour. She started 300 chapters of the Temperance Society all the way to Manchuria. Her health declined as she worked hard. Finally, she had to resign her position as the executive director of the Temperance Society in 1936 due to the poor health. She worked as an assistant pastor at Supyo Church and East Gate Church toward the end of Japanese occupation. Soon Korea was liberated from Japanese rule and suffered the Korean Conflict. In 1956 she was elected as the executive director of WSCS. Accepting the position, she said “I will accept it because it is God’s work.” As the executive director, she gladly overcame difficult circumstances, put the management of the Resting Hall on the right track, organized the Young Girls’ Society, and started mission projects to help prostitutes. She re-opened foreign mission projects that were banned during the end of Japanese rule. She was a teacher, an assistant pastor, the executive director of the Temperance Society and WSCS. She dedicated 50 years of her life to do God’s work. She passed away in 1978 at the age of 84. She remained as single woman and lived a devoted life for the Lord only. Her journey of faith is truly a living foundation to Methodist Women.